Every four years or so a new catalog comes out. Not a clothes catalog or card catalog but a whale catalog. A yearbook of sorts. Every whale in the Northern Resident Population represented. Their face is their dorsal and saddle patch, organized into neat, orderly matrilines that define their lives. The previous catalog came out in 2010 and was never out of reach on the Hanson Island observation deck. Its pages tattered and folded, annotations and revisions scrawled in black ink noting deaths, births, and disappearances. Over time the ringed binder that held the thick pages together began to fray and tear until the page holding the A5 pods tore at the plastic binding. Surge, Fife, Havannah, and the others threatening to tumble clear of the book and onto the wooden planks. The time to retire the 2010 catalog has arrived. The updated 2014 edition sits on my computer now, hogging a considerable amount of disk space, documenting all 298 of the northern resident orcas. The first page of the report has always been reserved for the A36s. But as I scroll to the matriline a hollow emptiness fills the page. There’s just one whale left. Kaikash, A46. The tell tale cut on the top third of his dorsal. I can hear his calls echo through the white, unblemished page where two other six foot dorsals used to stand. His brothers Cracroft and Plumper have passed on, leaving Kaikash as the lone surviving grandchild of A1, better known as Stubbs. Having a bond to an individual whale may seem silly. But when you know them all by name, their history, their voices, it’s hard not feel a connection. Even though they have no idea I exist. But those three brothers; Plumper, Kaikash, and Cracroft kicked my anthropomorphism into overdrive. Kaikash and Cracroft were the cool ones, the lady killers. Plumper, with his less imposing name, the awkward middle child. But they stuck together. Plowing up and down the strait, massive dorsals held high. The boys club, not a female in sight, persevering without mom. That’s how they looked to me on a rainy August day in 2007. I didn’t know who they were yet but it didn’t matter as they swam past me and my kayak, making me forget all about basketball shoes and hardwood glory. Turning my life upside down. Leading me to OrcaLab, to whatever it is that I do with myself. Cracroft past away in 2010. And last August Plumper struggled against the tide in Blackfish sound, gave up, and drifted back the way he’d come, his brother following loyally. Which left Kaikash to fend for himself. The death sentence for most orcas, unable to survive without mom, brother, sister, and cousin. But here he is. That dorsal still defiantly displayed on page one, the final relic of the A36s, of my rebirth, of my story. I can’t imagine there’d be a blog without those three. Last summer I hammered away at the chopping block near the lab. As the tide rose and the sun beat down a kayak group pulled into the back of the cove. I stared in amazement. Hundreds of miles of beach and they have to pick the one that’s inhabited? I keep swinging, halving and quartering the rounds, wooden shrapnel flying left and right. After lunch an older man picks his way across the beach and boldly walks up to the wood shed. “Excuse me.” He calls, waving his arms. I pull out my headphones, sweat running down my face. “Yeah?” He better not be asking me to wait until they leave to keep chopping. “That was Top Notch.” I answer. So it goes in the Orca world. Friends we barely even know saying goodbye. Vanishing. No wakes, no farewells, just an empty spot on the page, and a greyed out square. I move past Kaikash’s lonely spot and keep flipping through the catalog. “298 is a lot of whales,” I think, “more than there’s ever been since the study started.” I reach the page with the A4s, and my melancholy vanishes. There she is. Springer, A73. The miracle whale. From death bed to motherhood. Her baby Spirit’s picture just below, a strong black line connecting them. Nearly every pod has young calves, a good sign. More stories to be told, more memories to be made. Death just as much a part of living as birth. They all start out like Spirit. I smile and close out of the catalog. “They’re just like us,” I think. Dear God, I’m 27. I’m not sure what I thought I’d be when I looked through the crystal ball a decade or even five years ago, but this wasn’t it. I thought I’d have a steady job, a respectable career, and would be staring unblinkingly into the headlights of fatherhood. The reality couldn’t be more different. I’m a seasonal job hopping, wanna be John Muir apostle and nature writer who still spends far too much time playing this game. But for the first time since I walked off the UAS campus and had my respectable career tossed back in my face, I have direction. Or as close as my life comes to direction nowadays. Last summer I went golfing with Brittney’s uncle in Washington. While we waited for the ferry home, I laid in the back of the car and my heart started pounding. But seriously, what was I going to do next? I was all too aware that our bank account was drying, that the coming spring would bring some serious questions and answers that would magnify like ripples on a lake. The warm July sun worked its way across Orca Lab’s observation deck warming the weathered cedar planks. I sat cross legged on the deck, arms on top of the lowest railing, chin on my wrists, staring blankly out at the water. I was supposed to be counting humpbacks, noting sea lions, looking for the tell tale scimitar shape of a prowling orca. But the landscape swam before my eyes and I pondered the same persistent worry. The breeze fluttered, I thought about how much I loved it here. Loved being on the water, near the whales, the cedar forest, and the people. That was what made Orca Lab what it was. Paul, Helena, the never ending parade of volunteers from every corner of the world that gave Hanson Island its unique flavor. Where else had people touched my spirit like that? What place had the potential and power to do it again and again? Moments later the stress and fear that had taken up residence in my lower stomach melted away, draining through my pores to be caught on the westerly breeze, never to be seen again. Was it God? The universe? My own fevered mind racing through the card catalog of the brain for something that would satisfy? People pay me to write now. Not a lot, in fact I make peanuts or less than peanuts most of the time. But my computer and note pad are never far away and I scribble down ideas for novels, blog entries, and ridiculous limericks I don’t let out into the daylight. This summer, with a ball of anxiety, I sent the first 3,000 words of my wanna be memoir to Kim Heacox. “I want to have the fire,” I answered. I share my life with a beautiful women, two fantastic (fur) babies, and split my life between two places that pull at my heartstrings, demanding my eternal affection. Just fourteen months ago I didn’t know what I was going to do with my life. Now, I’m worried that I won’t have time to do it all. We are visual animals. What we see is what we get. Our sense of smell, taste, hearing, and touch takes a backseat to what hits the retina, is fragmented and sent to our brains. And yet the world is so much more than what we see. Or why would we ever get off the couch, board the plane and travel? We don’t want to just see it for ourselves, on a deeper level we want to taste, hear, touch, and smell. And yet… when we arrive our supporting senses again fall away. For nearly half a decade I’ve watched the behemoth vessels of Princess, Holland America, Norwegian and (gulp) Disney, trace the inside passage. From ten stories up the panoramic view must be breath taking. Never ending acreages of trees, oceans, whales, birds, and bears drifting below the eyes of those that have never seen the natural world in its element. Before their eyes is what brought them here. Is that enough to make one appreciate the land? To change lives? To understand what all can be lost if we don’t change and change fast? Do we need more? Trees and mountains may inspire as they roll by. But they are visual descriptions, easy to imagine, see, digest, and forget. From atop the ship or within the walls of the lodge, so much is lost. Layers upon layers of the natural world lay hidden just beneath the surface, invisible. I can’t pretend like I’ve always known this. 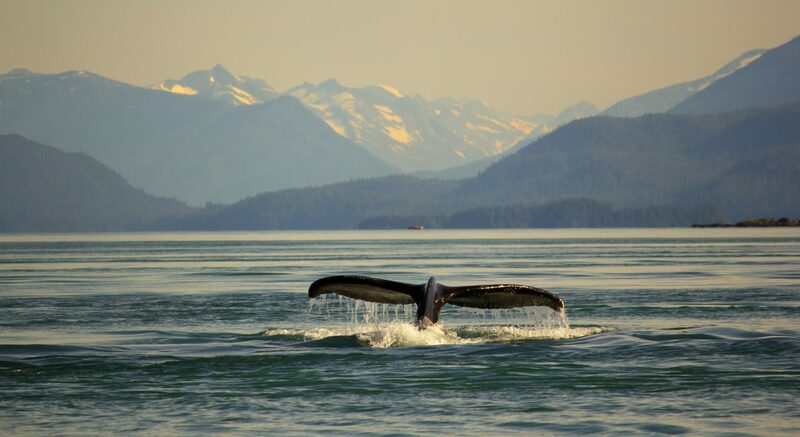 For three years I worked as a whale and bear guide in Juneau, side by side with the great white boats. While every day brought transcendent moments of beauty, a part of me felt empty. With the rumble of boat engines we felt compelled to add our own commentary and exclamations to the scene. It’s understandable as excitement bubbles over. But the anthropogenic noises of the boat, our feet, and the babble from other boats added layer upon layer to the acoustic scene until the sound of the whales was nearly extinguished. The click of the camera the running questions, the chirp of the iPhone removed the intimacy. I didn’t think I could be a kayak guide. Didn’t think I’d be able to handle watching whales vanish over the horizon while I paddle slower than I walk. I went into the summer unsure of how I’d adapt. Many days I came home without seeing a plume of whale exhaust, or the shadow of a bear. But when I did, an extraordinary thing happened. Without the white noise of man’s busy hands, we fell silent. No horsepower no clicking cameras, no thundering feet on metal, no screams and shouts. We were muted by the silence of the natural world. A world so still that from 50 yards you can hear a bear’s claws on the rocks as it turns over boulders. A moment so powerful you don’t as much hear the whale breath but feel it as it explodes from the deep end of the kelp bed yards from your bow. Sometimes we’d just bob meditatively on the tide. Glacier Bay holding us in a trance, hearing the voices we needed to hear; Murrelet, sea lion, harbor porpoise. It would be rude to interrupt. It’s not the pictures of the whale that I need. It’s the sound of their breath, audible from miles away. The slimy comfort of the kelp fronds wrapped around my kayak. The smell of salmon so strong that it permeates the ocean’s surface as they pulse beneath the surface. It’s blueberries on my tongue, Common Murres in my ears, whale breath in my nose. It took slowing down, not speeding up. Paddle strokes over four strokes. Smaller boats, smaller town, smaller mindset.